Oelwein Dollars for Scholars is a local chapter of the Iowa Dollars for Scholars under the National Organization of Scholarship America. This organization was officially organized in 1958 and the Oelwein Chapter was established in 1990 as a means to manage the scholarship program at Oelwein High School. The purpose of our organization is to raise funds & distribute them in the form of scholarship money to all OCHS seniors interested in furthering their education in any way. In 2017 we awarded a total of over $100,000 in scholarship aid to graduating OCHS seniors. to keep informed on our organization. Students will be completing an online profile at this site as their application process. Training on this process will be given during the year, so watch for further announcements on dates. The Oelwein FFA Alumni Chapter is designed to be a support network of parents, community members and past FFA members for the agricultural education program and FFA students. The FFA Alumni play a very important part in keeping agricultural education programs in our local schools. The Oelwein Husky Booster Club has been formed to support the athletes of the Oelwein School District. Meetings are the first Wednesday of every month at 6:30PM at the Oelwein High School Library. Everyone is welcome! Oelwein High School is asking for your help in seeking nominations for the Oelwein High School Academic Hall of Fame. 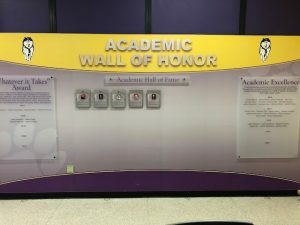 Started in 2016, the Academic Hall of Fame was created to recognize OHS graduates that have gone on to achieve outstanding successes in their profession, have made significant contributions to their community and society, and have demonstrated a positive influence in the lives of others. Honorees are inducted at a ceremony during Homecoming Week, and recognized on the Academic Wall of Fame in the OHS cafeteria. Nomination forms can be picked up at Oelwein High School, Hickory Grove Golf Course, and OCAD, as well as some local financial institutions. Nominations can also be submitted online at http://goo.gl/forms/2fe2SHDqnP. Selection criteria is posted below. Please contact Oelwein High School Principal Travis Druvenga at (319) 283-2731 with any questions. The Senior and Retired Volunteer Program (RSVP) is a point of coordination for volunteers 55+ and nonprofit organizations in need of volunteers. The purpose of RSVP is to engage individuals 55 and older in helping to meet community needs; and to provide a high quality life enriching experience for the volunteers. RSVP projects are nationwide and are part of the Corporation for National and Community Service (CNCS). There are over 700 projects nationwide; with 23 in Iowa alone. RSVP projects have been around since 1971, when 11 pilot projects were launched nationwide. From their viewed success additional projects were started across the nation. In 1972, RSVP of Black Hawk County was started. This project continued to grow and in 2001, Fayette County (Oelwein) became included in this project. RSVP, along with Senior Companions and Foster Grandparents is part of the National Senior Service Corps, which is under the Corporation for National and Community Service (CNCS). Although every RSVP project has to follow specific Federal Regulations, each project is unique - able to acclimate itself to the community it serves by addressing the respective community’s needs. Most projects have a local sponsor, who takes the responsibility and oversight for the development and direction of the program. Although locally there have been a few sponsors before, RSVP of Black Hawk and Fayette Counties has been sponsored by Covenant Medical Center since 1992. In approximately 1996, RSVP projects across the nation started gearing up to acclimate themselves to the idea and process of outcome measurement of the services provided by their volunteers. This was a big change for RSVP and yet it was a positive change as now RSVP could show a much better picture of the value of those services. Now many years later, RSVP projects nationwide are measuring outcomes of services provided. Although challenging and daunting at times, this outcome measurement reflects a more accurate picture of RSVP and volunteers. Click on the link below to visit the Black Hawk and Fayette County RSVP programs. The Oelwein Community School's RSVP is a member of this regional organization. Please use the links below to visit various organizations in Oelwein.